Gov. 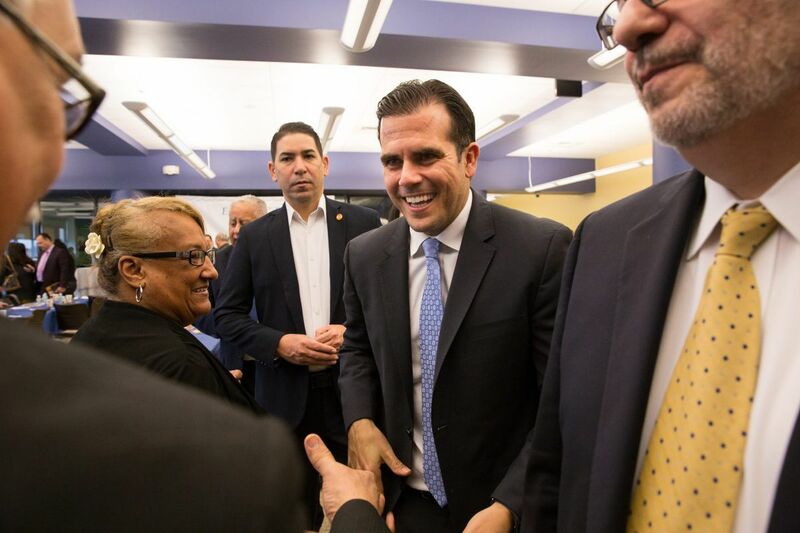 Ricardo Rossello, Governor of Puerto Rico, greets attendees after participating in a forum question and answer session at Esperanza College, in Philadelphia on Feb. 16. "The island endures." That's the quick pick-up from analysts Alexander Twerdahl, Alexander Goldfarb and Daniel Santos, of New York investment bank Sander O'Neill + Partners, after visiting bankers, landlords, and businesspeople in Puerto Rico, six months after Hurricane Maria wrecked services, shut factories, and left thousands dependent on emergency shelter or relatives on the U.S. mainland. The tough, generous character of Puerto Ricans came through, the team writes: "Everybody has stories of neighbors they've never met teaming together to remove downed trees and free up roadways after Maria. We heard of affluent businessmen heading into the mountains to deliver food and supplies, and being welcomed by people that tried to use that food, the only food they had, to prepare a meal for the relief workers." There was a sometimes bumbling and bureaucratic mainland relief effort: "Ports were clogged by relief items that were not needed by the population — certain [non-priority] food items, clothes — which meant rebuilding materials and generators, for example, couldn't come immediately." The Jones Act, limiting U.S. cargoes to U.S. ships, forced extra-long trips for cargoes of water and other items that weren't needed by the time they arrived. Short-haul trucking broke down: "Business owners were driving trucks to the ports to buy diesel with suitcases of cash, and armed for protection." So shippers sent barges from U.S. ports carrying "tanker trucks, each preloaded with fuel," and sent them to inland road crossings. That drove down the local cost of diesel "from $10 to $3 a gallon." U.S. retailers rushed to reopen. "Walmart set up an impressive temporary tent to serve as a store" after its location at DDR Corp.'s Palma Real shopping center was wrecked by Maria. The visitors found auto and truck traffic in metro San Juan jammed; many traffic lights were still out. Shopping center parking lots were "packed," with food courts, bank branches, phone shops, and department stores — from Sears and Kmart to Nordstrom's — so busy as to make U.S. landlords envious; still there were also many vacancies, and some damaged centers haven't reopened. In short, "the economic issues facing the island won't be resolved anytime soon," but "a sense of normalcy" is returning, Twerdahl and his team wrote. To be sure, "the power went out in San Juan for part of our visit." A visit to coastal Humacao, smashed by Maria's landfall, showed much of that area remains "a disaster." Florida Power & Light crews from the mainland are still fixing downed wires. One in seven islanders still don't have power. No one knows "how many Puerto Ricans truly left" after the storm; many were dependents — San Juan airport ran out of wheelchairs. "The consensus is that about 1 percent of employees have left," not a big acceleration over Puerto Rico's exodus over the past decade. Business owners insist "there is enough work for anyone who wants it," thanks in part to the surge in repairs to homes and hotels fueled by insurance and government aid payments. Banco Popular, one of the island's leading lenders, said it has actually gained customers since before the flooding, as more workers and businesspeople opened accounts to borrow, save, or manage rebuilding funds. The official job count has dropped modestly, by 4 percent; that's less than the island government's projection of a 9 percent contraction for the current fiscal year — to be followed by a 10 percent snapback in the new year starting July 1, and growth above the U.S. average for four years after that, effectively ending a 10-year period in which the Puerto Rican economy shrank as U.S. tax breaks for Puerto Rico factories expired. Insurance claim payments and U.S. aid should "drive a few years of meaningful economic growth," but business and government leaders have finally accepted the colony can't depend on Washington long term, and "must restructure." While the old tax breaks are gone, there is hope for manufacturing: the island's work force is the best educated in the Caribbean; Johnson & Johnson, Merck, and other drugmakers have kept plants open because they found that "factories in Puerto Rico have higher productivity than factories elsewhere in the world," as they were built relatively recently and staffed by pros who would have to leave the island to earn more. Puerto Rico also remains "a beautiful island, in the Caribbean, with direct flights from many U.S. cities," no restrictions on travel to and from the U.S., and a lot of tourist-industry repairs happening now (almost a third of hotels are still shut). So there's room for hospitality growth, since tourism is currently just 8 percent of Puerto Rico's gross domestic product, compared to 25 percent for manufacturing. Maria hit as Puerto Rico was struggling to restructure more than $100 billion in public debt. That's an opportunity if government can use the bankruptcy court to solve long-term problems: Industry needs more reliable electric power than the government-controlled monopoly delivers; protective labor laws "make it tough for employers to hire" (and especially to fire); and building permits are "excessively slow, the government is too big, and taxes are too high." The island oversight board is pushing to weaken labor-protection laws and to privatize the PREPA utility, and to cut the effective corporate tax rate. "The poker game between the bondholders and the Puerto Rican government is that both sides know there will be reform," but they have not yet agreed on settlement terms, the analysts added. Businesspeople see U.S. aid "as a bridge" that can help keep businesses and families healthy while the government modernizes. As Puerto Rico's fiscal restructuring winds through the courts, both sides hope the appointments by President Trump to the PROMESA fiscal oversight board will maintain a careful balance so they can pay down the debt and move on.